Due to economic hardships, The US Golf building located at 5690 Monroe Street had closed and the property was ultimately seized by the lender. Due to the lack of new office-related product on the market, and considering there were only a handful of buildings that could accommodate users of 10,000 SF, JMS speculated 5690 Monroe as a potential office redevelopment and quickly finalized terms to acquire the property. At the onset of the due diligence period, JMS identified and targeted potential users for the property. Through their efforts, they identified a highly-reputable oral surgeon, Dr. Stephen Shall, who wanted to relocate into a property he owned. Partnering with Dr. Shall during the due diligence period enabled him to contribute creative input into the redevelopment of the project. He liked the idea of having enclosed parking and wanted to work on concepts that kept that aspect of the building. The property was a 15,000 SF retail center situated on a 1.29 acre site. 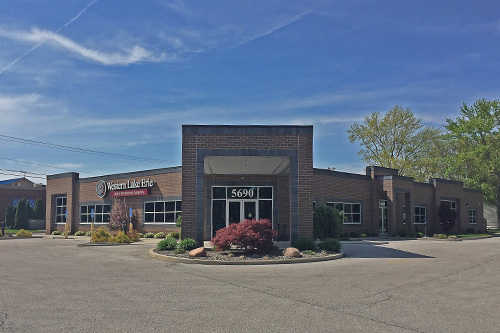 It consisted of approximately 12,000 SF of showroom with 3,000 SF warehouse/garage. Due to current zoning standards, the building would need to be reduced in size, in order to satisfy the parking/density requirements. The building also lacked curb appeal and was hidden from the street. It was determined a new entrance and tree removal would solve this issue. JMS managed the project from start to finish. JMS took an old, 15,000 SF retail building with no curb appeal and redeveloped the property into a 10,000 SF, State-of-the-Art Surgery Center.